I have looked for a photo of the Kawasaki top before and could not find it, what shows how different was life before the world wide web. Perhaps one of the collectors that have been around since before ebay would have it: Don? Lourens? Cyril? I would love to see it. That is a great find, Jack! But it is not the Kawasaki Steel top. That top is taller than wider while the Guinness Record was wider than taller, more like the aspect ratio of the most common koma. Although I wouldn't be surprised if it was a (steel) flywheel type, as Joe suspects. 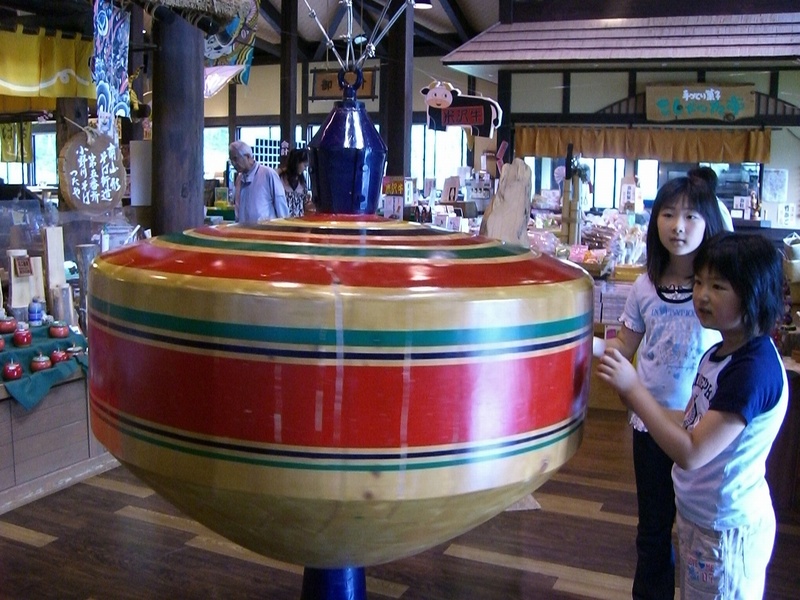 The top on the photograph is a Sasebo koma typical of a port close to Nagasaki in the south of Japan. According to Wikipedia, Kawasaki Steel (now JFE Holdings after merger with NKK ) was from Chiba, in Tokyo Bay. Is that tip like a pyramid? Nice finds! Do you know where in Japan they are located? thank you sir! the first set of pics are from oshu city. the 4th pic is from Onogawa Onsen. 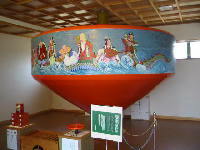 and the fifth pic "Spinning Top Museum in Japan Fukuoka Prefecture Iizuka Tateiwa 1122-1, the location of the museum is the national highway along Route 201. It proceeds to the east in front of the city hall Iizuka, you should keep in 500m as advanced beyond the overpass of Chikuhohonsen. I think because there is a big sign on the left side, and easy to search." 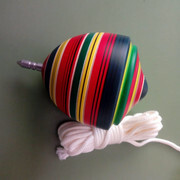 I have a small Japanese top like the first big one pictured, it too has a pyramid point. i have found video of this top!!!!!!!!!!! What happend to the videos?? How can we put them back?? I would love to to see them! !